Lamarckian is an adjective which requires a noun after it. The next time you hear or read something is “Lamarckian” ask (at least yourself), “Lamarckian what?” Lamarckian inheritance is no problem. If a cell doubles in size and divides once, no matter how the material is distributed among the two offspring cells, fifty percent of that material was acquired rather than inherited by the parent. So the inheritance of acquired characteristics is ubiquitous. Lamarckian evolution however is a different matter. The preferential inheritance of acquired adaptations over acquired maladaptations, if true, would be a miracle – the kind of thing Daniel Dennett called a skyhook rather than a crane. The same thing is true socioculturally. An individual may learn something from their own experience, by trial and error for example, and it may be passed on by social learning. But that is no reason to believe that it is therefore likely to spread preferentially socioculturally. A colleague once pointed out in conversation that masturbation and nose-picking may be rewarding in some cases but are hardly likely to become social norms. The fact of the matter is that sociocultural innovations, whether inherited or acquired, are no more likely statistically to be biased in the direction required for them to succeed than are biological innovations. Most fail – whether we are talking about citations to scientific publications, the utilization of patents, the marketing of new products, or the founding of new businesses. 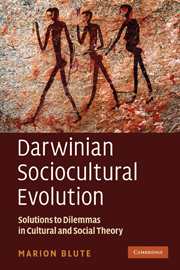 Sociocultural evolution is Darwinian rather than Lamarckian.